This bellows seal type needle valve has been specifically developed so that it can satisfy the requirements for such areas in which leak is a concern of vital importance. 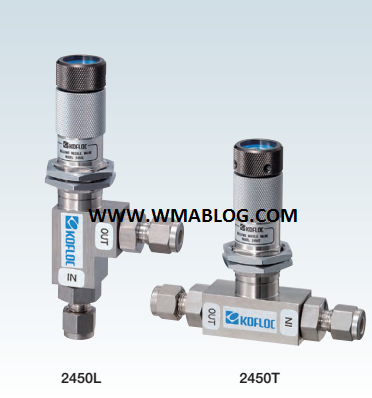 Model 2450 Bellows Needle Valve has a construction to drastically prevent fluid leaks. In addition, it is outstanding in heat resistance and corrosion resistance, so the customer can use it with peace of mind not only in such adverse conditions where high vacuum, high pressure, high temperature or extremely low temperature is present but also for corrosive, toxic or costly fluids. 100% leak test is conducted before shipping, using a helium leak detector. The incorporated non-rotary type needle provides precise, smooth control of minute flows. Flows are scarcely affected by ambient temperature fluctuations, remaining within an insignificant range of flow variations. This superior temperature characteristic is applicable to gases only, and not to liquids, because the viscosity of a liquid may greatly vary depending upon the temperature conditions.